The troubles continue for The Expendables 4. Recently, it was announced that franchise star and creator Sylvester Stallone departed the fourth installment, but the project is reportedly going to be moving ahead without him. If that is indeed the case, then The Expendables 4 is also going to have to press on without Arnold Schwarzenegger as well. Entertainment Weekly caught up with the actor, who has been in all three previous Expendables movies and is good friends with Sylvester Stallone. It turns out, if Stallone isn't going to be involved, Arnold Schwarzenegger wants absolutely no part of The Expendables 4. Here is what he had to say about it. "There is no Expendables without Sly. I would never do the movie without him, no." With Sylvester Stallone, who directed and co-write the first Expendables, in addition to co-writing the other two installments, leaving the project was already going to be a lot to overcome. But with Arnold Schwarzenegger also out, that will take a lot of appeal off the table before things even get moving. 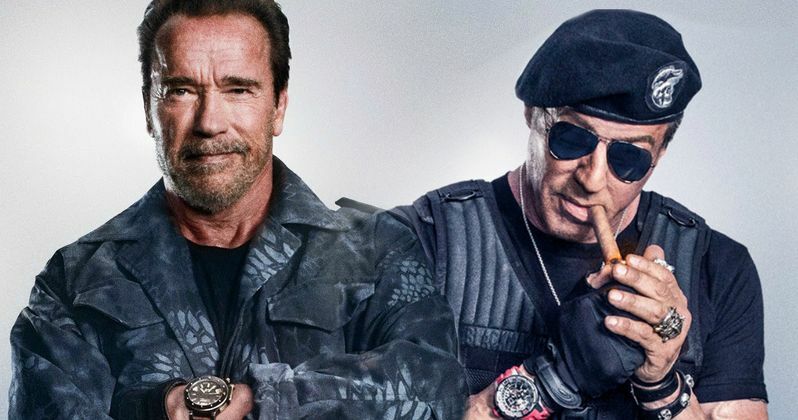 EW also reported that Schwarzenegger hasn't even seen a script for Expendables 4 yet, though they want to shoot the movie in August. He explained that he wasn't thrilled with his part in Expendables 3, but if Sly were back on board and he liked what they wrote, he would return again. "You know, I think the first and second one were terrific. But, the third one, I thought my part was not written well. It was also not playing well in the movie, as far as I was concerned. Maybe other people believed differently. But I didn't believe that I had any value in the movie. I love the franchise, by the way. I think it's a spectacular franchise, The Expendables. I think that Sly has good ideas, what he wants to do with it, and I think if they write a really good script [in] which my part is very well-developed, I would do it. If not, then I won't do it." It doesn't appear that Sylvester Stallone will be easily coaxed back to do The Expendables 4. He reportedly walked away from what would have been a $20 million payday, which is true superstar money. He apparently had disagreements with producer Avi Lerner, which is something that has been going on for quite some time, but finally came to a head this time. Here is what Avi Lerner had to say in a statement following the news that Stallone had walked away from what will be the final Expendables movie. "We've got disagreements with Sly, but we've had them for over a year and a half. Right now, each one has opinion. We agreed on 95% of things, but there are certain things in production we don't agree on. I don't think it's over, but write whatever you want. In my opinion, it's not dead." While the Expendables movies aren't what you would call critical darlings, especially in the case of The Expendables 3, the movies have done well at the box office. To date, the franchise has earned $804 million worldwide, with The Expendables 2 earning the most at $315 million. As of right now The Expendables 4 is slated to come out in summer 2018 and be the final movie in the series, but all of this mess could easily delay, or maybe even scrap those plans entirely. And as yet, no cast members have been announced. We will be sure to keep you up to date as more details become available.